Anti-trans activists have successfully lobbied Internal Affairs Minister Tracey Martin into stopping a sensible and simple law change that would have made life easier for trans, intersex and non-binary people in New Zealand. We need to coordinate a powerful marketing campaign to ensure that although they may have won the battle, they will not win the war. 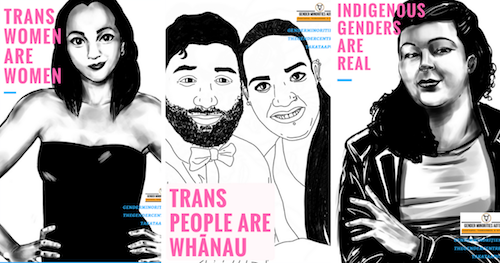 In 2018, we worked with InsideOUT and Gender Minorities Aotearoa and crowdfunded thousands of beautiful posters and stickers to share love and support for our gender diverse whānau. We'd love to get more stickers and posters printed, this time with a call to action to sign our submission in support of amendments to the laws to treat trans, intersex and non-binary people fairly. Need to know more before you donate? Check out our Annual Reports for 2017 and 2018. You can also read our donation policy here.